The following are some events in the life of the road with many names. This page is about the actual street/highway/interstate only. See the links below for the buildings that line it. 1851-54: The Territorial government authorized the Minneapolis and Lake Minnetonka Plank and Road Company to build a plank road which appears to have been the precursor to Superior Blvd. The Held family homesteaded land on either side of what would become Highways 100 and 12. Their land encompassed 42.5 acres in Golden Valley and 50 acres in St. Louis Park. The property included 36 acre Lake Virginia, which was fed by springs. It took 7 months to drain it by ditches so it could be used for farmland. The only remnant of the 60 ft. lake now is a 2 acre storm sewer pond that was put in in 1986 when I394 was built. Held had 90 acres of crops, ranging from feed and grain, flowers, and vegetables, including their famed white celery. What is now the intersection of Highways 100 and 394 was a tomato field high on a gravel hill. Highway construction took a toll on the farm and it stopped production in 1949. In 1956, however, a Julius W. Held, truck farmer, was listed in the St. Louis Park directory at 5051 Wayzata Blvd. This was on the north side of Highway 12, across from Evanoff Gardens. Golden Valley was incorporated as a Village, population 467. St. Louis Park was incorporated as a Village, population 350. A picture dated 1893 showed a crew preparing the ground for Superior Blvd. It’s identified as near Batson’s Corner. Superior Blvd. was built between 1896 and 1901. Notes from August 1900 indicated that the St. Louis Park Village Council worked with Golden Valley to create/grade Superior Blvd. The Village took a portion of road from Moesen’s Corner east to D.D. Sullivan’s property. The [Minneapolis] county commissioners took the first step toward making Superior Blvd., the trunk road connecting the city with the north shore of Lake Minnetonka, a modern thoroughfare. In 1918 John A. Johnson platted an eponymous subdivision. See Yngve. In 1920 one stretch of the road was widened to 18 feet. For awhile the highway was the only paved road west of Minneapolis. Superior Blvd. was closed most of the summer of 1922. The 3.8 miles from Lyndale to the Great Northern viaduct was paved with “asphaltic concrete.” The existing 14-foot strip of bituminous macadam was broken up and used as the sub-base for the new pavement. The new road was to be 27 feet across. Also in 1922 a 30-foot roadway was graded on the north side of the boulevard between the Great Northern bridge and the Minneapolis city limits. That section was graveled. In 1923 the one and a half mile stretch between the Great Northern bridge and the Minneapolis city limits was the last section of the boulevard between Minneapolis and Lake Minnetonka to be paved. In October it was widened to 27 feet. A portion of the road from the top of Tyrol Hills, east down the hill past the intersection with the Theodore Wirth Parkway, was paved with brick. The work was urged by the Civic and Commerce Association and the Automobile Club. Although the state highway department was paying for the road outside of the City, Minneapolis was responsible for the stretch inside the city limits. Further improvement of the State road was dependent on Minneapolis paving its road. In 1926 the stretch from Minneapolis and several miles out was paved at 27 feet, but the rest of the way to Minnetonka was only 14 to 18 feet wide. That section was paved and widened, and the road opened in July 1926. Also in 1926 there was a Superior Inn listed in a business directory, located at Superior Blvd. and the Dan Patch crossing. And in 1926 the Superior Blvd. Bus Lines got residents downtown. This may not have lasted, because Northsiders from the ’30s and ’40s report that they took the Greyhound bus into town for 20 cents. Paul Pegors, who grew up at Kentucky and Wayzata Blvd., reports that the Golden Valley side of the road was nothing but acres of potatoes. On November 4, 1931, the Village Council approved the request of Rufus R. Rand, Mayor of Wayzata, to change the name of Superior Blvd. to Wayzata Blvd. A Minneapolis councilman reported that Wayzata means “North of the Pines.” Rand reasoned that the name Superior was misleading, in that it did not go anywhere near the city of Superior. A 1931 map seems to indicate that the St. Louis Park section of Superior Blvd. stopped at Texas, where it veered northwest. In 1935 a State Senate investigation looked askance at payments for land along Wayzata Blvd. that one highway department official decried as 16 times its value. What’s worse was that Fred Ossana was believed to have some part in the transaction. By the way, the paper was still calling it Superior Blvd. During the 1930s the road was concrete and had three lanes – one for each direction and one in the middle to pass. At some point during the 1930s, a grade separation was built taking Superior Blvd. under the Great Northern tracks. The North Side was prone to brush fires, but the worst was in 1936. The Highway 100/Highway 12 Cloverleaf was opened on November 25, 1937. Construction had started on June 20. Highway 12 was being built as a two lane, divided highway with 24 inch lanes. The road was built with WPA funds. Highway Department statistics showed that in 1937, Wayzata Blvd. had the highest traffic volume in the state. 6,653 vehicles traversed the road per day. Highway 100 would not open until 1939. Development was slow at first in the Wayzata Blvd. corridor, partly because it was basically a wetland based on peat soil. Golden Valley residents rejected development proposals for an airport, drive-in theater, and sports stadium along Wayzata Blvd. See Candlestick Park. As with Highways 100 and 7, in 1950 the Village signed a contract with the State promising to allow no curb gas pumps, gas stations, or billboards. Curb gas pumps went by the wayside, but there were plenty gas stations and billboards. Superior Blvd. was widened to four lanes. The four lane Highway 12 was completed from Minneapolis to Trunk Highway 101. In earlier years the road had been known as Highway 10, Superior Blvd., or the Glacier Trail.Highway. McCarthy’s Cafe, one of the few businesses on the road, was placed on a service road that was still called Wayzata Blvd. The road was scheduled to be redesigned, and a signal installed at the intersection at Turner’s Crossroad on the north side of Highway 12 and just east of where Vernon (now Park Place) would be on the south. On the Golden Valley side you can still see where the road goes right up to the new highway and stops, just west of the Metropolitan. St. Louis Park annexed Shelard from Minnetonka. Today it is the only St. Louis Park land north of Highway 394. The land in Golden Valley north of Highway 12 was changed from open development to commercial. In 1956 it was rezoned industrial and light industrial. An article from the January 22, 1959, issue of the Minneapolis Tribune asks, “Will Wayzata Blvd. Be ‘Prestige Ave.'” It revealed that the real estate firm of Rees, Thomson and Scroggins planned to create and industrial park on about 100 acres of land it controlled from Florida to Pennsylvania Avenues and from Wayzata north to Laurel Ave. The area was a known peat bog, but given the convenience of the location, the cost to put down extra footings was thought to be worth the price. During the past year, three firms had located in the area: Products Design and Engineering Co., Manufacturers Alliance, and Minnesota Toro, the latter building on land leased from Midwest Steel Co. The article also said that improvement of the road was already in the planning stages, and that the Minnesota Highway Dept. owned enough right-of-way to develop a six-lane highway. At a hearing two weeks prior, the Department presented plans for the segment from the Minneapolis city limits to Highway 100, and residents expressed a desire to move an interchange planned for France Ave. to Penn. A public hearing was planned to discuss plans for an interchange at County Road 18 (now Highway 169). Both Golden Valley and St. Louis Park wanted a crossing at Turner’s Crossroad. In February 1959, Mr. E.J. McCubrey of the State Highway Department appeared before the St. Louis Park City Council to discuss plans for Highway 12. Council notes indicate that adjacent landowners wanted a “peel off lane” or cut off from 12 to the north. McCubrey indicated that such a plan would probably not be approved by the Bureau of Good Roads. Notes from the City Council in the summer of 1960 indicate that Mn/DOT did make improvements to Wayzata Blvd. between County Road 18 (169) and Highway 100. The south service road must extend across the tracks at grade. There must be a full diamond at Louisiana. The Texas intersection must be designed the same as Turner’s Crossroad. The SLP City Council passed a resolution approving a traffic signal at Hwy 12 and Louisiana. (New) Stoplights at Turner’s Crossroad and Louisiana were installed in 1967. In 1968 the area southwest of Highways 12 and 100 was paved, got curbs and gutters and storm sewers. Highway 394 was added to the interstate system in 1968, and originally was to be called 894. In 1969 its number was changed to 394. (Minnesota State documents do not appear to have referred to the road as 894.) The road was to run east from I-494 in Minnetonka to Washington Ave. in downtown Minneapolis, following the old Highway 12. The routing of I-394 along Highway 12 was hotly debated. In December 1973 the Golden Valley City Council passed a resolution opposing “the designation of any corridor for I-394 touching on Golden Valley until the need is convincingly demonstrated and an acceptable design is presented” and that it would not re-consider until an acceptable overall transit system for the western suburbs was designed. In contrast, in January 1974 the St. Louis Park City Council sent a letter to all Park households announcing that it had unanimously decided to support the location of I-394 along the present right-of-way of Highway 12. 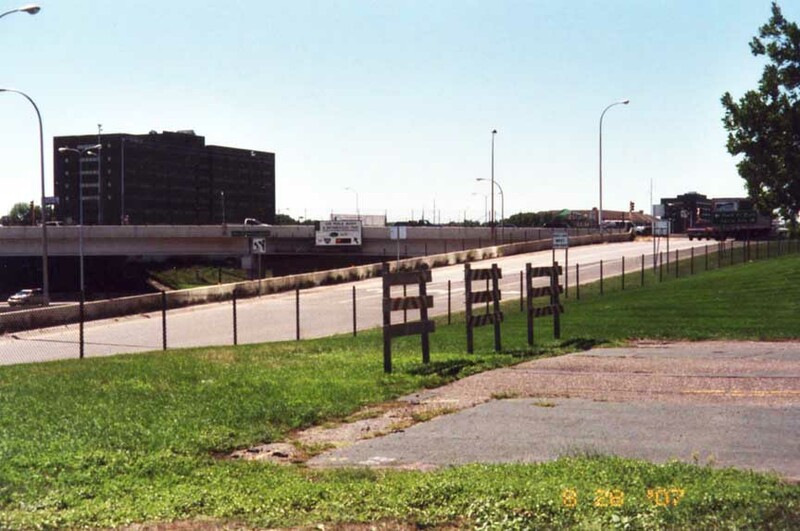 An article in the Hopkins Sun estimated that if Mn/DOT approved plans for construction of I-394 along Highway 12, work would probably begin in 1975 or 1976. In December 1979, HOV lanes were proposed for the projected Highway 394. View of the south side of Highway 12 in September 1980. Cooper Theater in the foreground, 5353 Building and Honeywell in the back. A picture from 1981 shows the Wayzata/Louisiana intersection all torn up, and may be when several businesses, including two gas stations, were removed. Construction on the new Highway 394 began in 1984, and started with a stretch west of 494 in Wayzata and Minnetonka. The delay between conception and implementation may have been due to land acquisition problems and significant protests. It was estimated that about 400 parcels of land would have to be purchased at a cost of about $100,000. The 494 interchange opened in around 1986. The section between the Shelard Parkway overpass and General Mills Blvd (including the US 169 interchange) opened around 1987. In 1988 the sections between 494 and near I-94 opened. 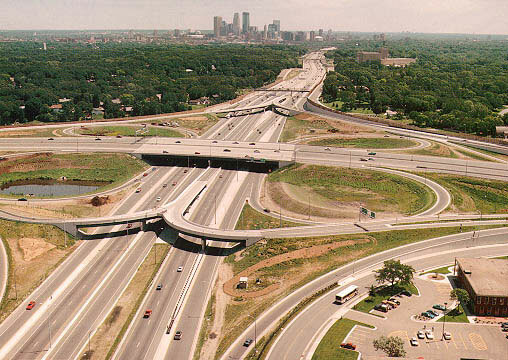 Construction of the 394/Highway 100 interchange began in 1989. 394 opened in 1991. It was the most complicated piece of the project and a lot was stake – one estimate was that 170,000 vehicles drive that intersection daily. The section east of I-94 was opened in 1991. The road was finished in 1993. The final cost was $450 million for 9.75 miles of roadway. In 1996 the Federal Highway Administration (FHWA) awarded the I-394 Transit Corridor an Excellence in Design award. MnPASS: Interstate 394 is the first route in Minnesota to have a toll lane. Planning culminated in 2004, and signs regarding the new toll lanes were installed in 2005. MnDOT chose this option to help reduce congestion on the adjacent regular lanes. The tolls vary depending on time of day and cost up to $3 in an effort to keep the high occupancy vehicle/toll lanes flowing. Project costs are estimated at between $8 and 10 million. A private company constructed the toll lanes project and covered 25 per cent of the overall cost. Motorists use the lanes via a prepaid toll account and associated transponder.